There is a proven risk in teams called “social loafing”, identified and summarized in a study by French engineer named Maximilian Ringelmann over one hundred years ago – back in 1913. His simple study concluded that the power of two horses pulling a coach did not equal twice the power of one animal pulling. This observation can be extended to people working on teams in a variety of ways. It is potentially very disturbing to think about this in today’s team-intensive environment. People are not workhorses. the need for teamwork goes a step further, as it is downright essential for complex work where specialists with deep expertise are needed. If we can accept that social loafing is real and project managers need to be aware, but also accept that the need for teamwork is real and even more essential than ever, we can begin to look at ways to manage the social loafing effect. Try to avoid pairing people to work on the same thing, unless they bring two complementary skillsets to the table. This will screen out most social loafing. Group task work on the project by specialist skill…and try to task individuals in alignment with their skills. This will encourage people to ‘pull their weight. Measure progress by tracking the individual skill areas. 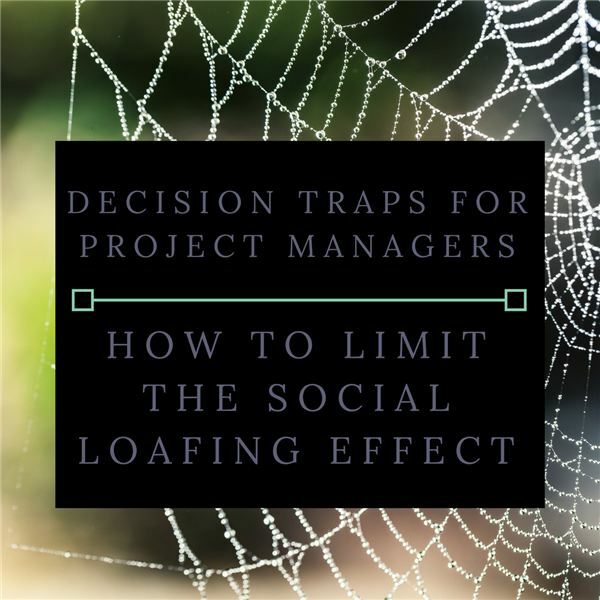 While you are interested in overall project progress, measuring the various skill elements for progress isolates producers, who then will be less subject to social loafing. Avoid classifying everything as group work. Only do it if it is a benefit, and when you do, ensure that people are also assigned responsibility. Limit measuring group performance, as people may avoid responsibility for the outcomes. Are you organizing your team tasks for optimal productivity, balancing concern for the social loafing effect with the benefits of teamwork?